This activity was modified from an Advanced Placement Investigation for use with freshman classes. The instructions are clear and require students to examine data and create a graph. Then students collect their own data using Choice Chambers and can choose which variables they would like to test: wet vs dry, water vs vinegar, light vs dark. I use flour beetles because I maintain a culture of them in my class. (Mealworms are fed to the bearded dragon.) The beetles respond fairly well to the variables presented, but the larval mealworms don’t. You could potentially substitute with crickets or collected pillbugs. In the spring, or fall, pillbugs can be collected from under rocks and in leaf litter. I have also maintained a culture of pillbugs for the advanced classes. The activity could be used as part of a unit on the scientific method, focusing on how variables are tested, how to collect and organize data, and how to write conclusions. 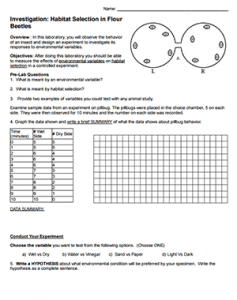 You could also use this activity with lessons on ecology and animal behavior, focusing on habitat selection, genetics and evolution. The advanced version, “Animal Behavior Investigation” is more open-ended and requires an in depth look at how behavior is studied, including examples of ultimate and proximal questions. It is presented in a case study format and takes several days. I originally tried this as an inquiry lab, but the younger students really couldn’t stay focused and just wanted to play with the bugs. The instructions are a little more clear in this version in order to keep students on task. I also suggest cutting filter paper to line the bottoms of the choice chambers. When using paper towels, the insects would often crawl underneath the towels and stay. I also originally had other choices in the mix (ethyl alcohol, sugar water, vanilla…etc) but reduced the number of choices to make it easier to set up and manage in large classes.